Reach for Resources (Reach) invites members of the community to participate in its annual Bowl-A-Thon, being held Saturday, April 13, 2019, 10:00 a.m.-1:00 p.m. This is the 27th year of this annual bowling fundraiser. The event will take place at Park Tavern. Participants can form their own team of 4-6 people or be placed on a team. Each person must collect a total of at least $60 in pledges and donations. However, those registering by March 15 can reduce that minimum to $50. Pledges and donations are due prior to the event to qualify for bowling and lunch. Those wishing to attend for the pizza lunch only can register for $20. Registration and pledge forms are available at https://www.reachforresources.org/. Proceeds will go towards Reach for Resources’ mission of supporting individuals with developmental disabilities and mental illness. 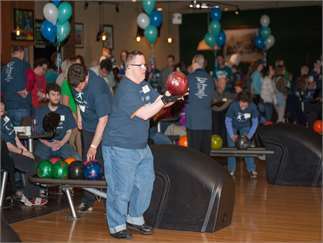 Bowlers will receive t-shirts, and prizes will be given out for fundraising efforts and for bowling strikes. While all bowlers will receive a prize, some may earn one valued at over $100.